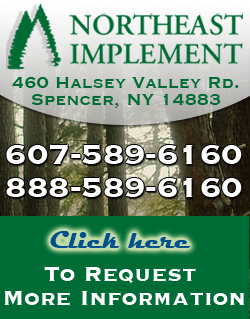 Northeast Implement carries several manufactures who all exceed our standards in rugged reliable equipment. Products include Tractor mounted skidding winches, tractor grapple's, wood chippers, skid steer attachment's, excavator grapple's, clamshell bucket's, rotator's, trailers and loaders, PTO shafts, tilting buzz saw's, processor's, wood packaging implement's, wood splitter's, logmatic wedge axe's, tiller blades and more. ​ Have confidence in a business who has been established since 1976. ​We stock spareparts in the US and offer full product support with a knowledgeable staff with over 35 years experience.